Lost Your Ring? We can help! Looking to rent/hire a metal detector? Why not find a metal detecting specialist who can help you find what you thought was lost forever. 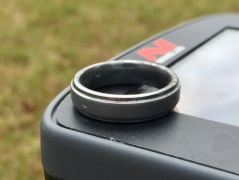 By contacting one of the metal detecting specialists on The Ring Finders Directory, you will have a much greater chance of success in finding your lost item. We specialize in finding lost rings, watches, pendants (all jewelry) also cell phone & keys. Lost at beaches, parks, lakes and yards. Check your town & city for a metal detecting specialist near you. Your Ring has a story attached to it… that story ends when you lose it! 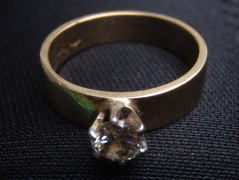 You now have a chance to continue that story by hiring a metal detecting specialist to find your lost ring! Photos donated by The Ring Finders team of independent metal detecting specialists. You truly are an angel and others like you that reunite sentimental and valuable jewellery with their distraught owners. I believe in angels and one knocked on my door on Saturday, August 3, 2013. For the 5 previous days, my family and I had frantically searched inside my house and in the garden for my cherished engagement ring. 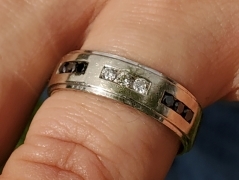 I received this beautiful ring from my husband on December 23, 1967 and have worn it for 45 and a half years.My beloved husband passed away 13 months ago and my wedding rings and 25th anniversary band became an enormous comfort to me. 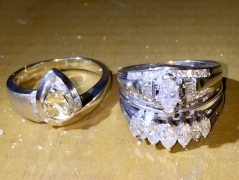 I started wearing the rings 24/7 and even had the diamonds checked for loose stones. My worst fear was that I would lose the solitaire diamond from the engagement ring. Imagine my horror when on Sunday evening, July 28th 2013, I discovered the engagement ring missing from my finger after watering my front and back garden. After searching and searching for my ring to no avail, I found Chris Turner and TheRingFinders on my computer. He came to my rescue on Saturday August 3, 2013 and located my precious ring in my back yard in less than 5 minutes. I was completely astounded as my son-in-law and I had searched the area where Chris found it. Apparently, I had stepped on the ring and it was embedded in the dirt under the grass. I would never have found it on my own. I was overwhelmed by Chris' professionalism, experience, kindness and caring. To me that ring was irreplaceable. Thank you so much, Chris. You truly are an angel and others like you that reunite sentimental and valuable jewellery with their distraught owners. I highly recommend Chris as I thought my beautiful ring was gone forever. It meant the world to me and am so thankful for Chris' help. I will never forget the sight of my ring in his hand as he presented it to me. Thank you again Dave! You are an angel. Thanks for your efforts Jonathan. You were very professional, responsive, and intelligent in your effort. I was playing basketball in my driveway one afternoon with my kids and after chasing down a loose ball, extended my arms to grab it. 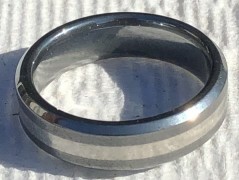 When my hand stopped its extension, my wedding ring kept going. As if in slow motion, I felt it slide completely off my finger, didn’t see where it went, and then all I heard was silence. No rustling of leaves as it hit the grass or flower bed and no ping sound of metal hitting concrete. Only silence, followed by that sinking feeling of something that’s gone horribly wrong. I proceeded to spend several hours over the next 2+ days performing the reenactment and sifting through leaves, grass, and street looking for my ring. While researching rentals and a potential purchase of a metal detector, I came across theringfinders.com and Jonathan Hamill. Sent him a text and he was very responsive. Over the next half hour, we had discussed the story and coordinated a meeting time. He showed up at my residence and the search was on. About an hour later, I had news that he had found my ring, in a seemingly unlikely and impossible landing spot I might add. I was out of the doghouse and the world was right again! Thanks for your efforts Jonathan. You were very professional, responsive, and intelligent in your effort. You will be highly recommend to anybody I talk to with a similar situation. Never found my target, but I did find family history. Nails and Sharp Objects Removed from Children’s Play Area .. Fountain Valley, CA.